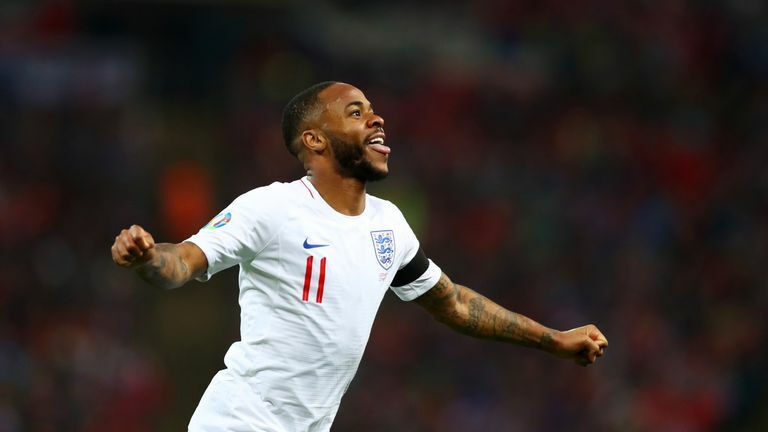 England got their Euro 2020 qualifying campaign off to the perfect start with a thumping victory at Wembley in Group A, with Raheem Sterling's hat-trick added to by Harry Kane's penalty and a Tomas Kalas own goal, which came after Hudson-Odoi's shot was saved. At 18 years and 135 days, Hudson-Odoi became England's youngest debutant in competitive internationals, eclipsing Duncan Edwards' record set in 1955. With Jadon Sancho also on the pitch, it was the first time in 138 years that England had two players aged 18 years old or younger in the side. Hudson-Odoi told Sky Sports: "I'm definitely delighted. I want to thank everybody for helping me get here, and to get the opportunity to play today is a massive feeling in front of the home crowd as well. Hopefully there's many more to come. "I couldn't believe it (when I was told to get ready). I didn't think it was real. I was looking around the crowd and everybody looked happy - I couldn't believe it. Sterling became the first England player to score a hat-trick at Wembley since Jermain Defoe in September 2010, scoring with all three of his shots in the match. "I said to myself coming into this campaign that it's about replicating my club form," the Manchester City forward said. "I had full confidence in myself. I've kept working and I've kept being positive. Sterling revealed a T-shirt in tribute to a young footballer after scoring his second goal. Damary Dawkins, a Crystal Palace youth team player who had been fighting acute lymphoblastic leukaemia for four years, died on Sunday aged 13. Sterling's T-shirt under his England jersey had a photo of Dawkins and the message "May your soul rest in peace". "Damary was a kid that I was trying to help and we thought that we found a donor. Sadly it didn't match and he sadly passed away," he said.